Superfund Site once housed an industrial facility and landfill. Rapid reduction needed to avoid off-site migration of daughter products. Simultaneous application of Enhanced Aerobic Biodegradation, Bioaugmentation and In Situ Chemical Reduction (ISCR). This former industrial property had a landfill that was used in the mid-1900s for disposal of magnesium dross and refractory brick as well as breakout material from electrolytic chlorine cells. As much as 254,000 cubic feet of material were removed from the landfill although a large chlorinated solvent plume remains both from landfill waste below the water table and from industrial operations on-site. A feasibility study for the site was approved in 2012 which evaluated the use of enhanced reductive dechlorination to treat dissolved chlorinated solvents at the site and to prevent off-site migration past the property boundary and beneath a highway. A pilot test to evaluate at least two different biological amendments was conducted and Regenesis supplied 3D Microemulsion, BDI, and CRS for the evaluation. Three aquifers exist at the site, but the pilot test was performed in the first groundwater bearing unit only. After a review of sulfate concentrations, other natural attenuation data, and cVOC concentrations it was determined that the optimal treatment choice would be to test a combination of an electron donor in the form of 3-D Mircoemulsion®, a bioaugmentation culture called Bio-Dechlor INOCULUM® Plus, and the use of Chemical Reducing Solution® (CRS) to prevent any hydrogen sulfide toxicity and to promote a level of beneficial in situ chemical reduction (ISCR). For the pilot test 10 injections points were used to place 800 pounds of 3-D Microemulsion, 18 liters of BDI Plus and 400 pounds of CRS. The product was injected over a 10-foot interval. The goal for this project was to attain as rapid reduction as possible for the site specifically to avoid off-site migration of daughter products such as vinyl chloride. Therefore, it was deemed beneficial to inject all three proposed products at once. The product was injected in March 2014 and results at roughly 1 month post injection are extremely promising. PCE has been reduced from 134 ppb to 1.57 ppb, TCE from 271 ppb to 1.77 ppb, and cic-1,2-DCE from 235 ppb to 4.25 ppb. Vinyl Chloride has shown some increase from non-detect to 13 ppb. However, Dehalococcoides has increased from non-detect to 7 x 10×5 cells/bead and vinyl chloride reduced from nondetect to 9 x 10×4 cells per bead which strongly correlates to the rapid enhanced reductive dechlorination. 3-D Microemulsion is an engineered electron donor material that offers a novel 3-stage electron donor release profile, pH neutral chemistry and is delivered on-site as a factory emulsified product. BDI Plus is an enriched natural microbial consortium containing species of Dehalococcoides sp. (DHC). 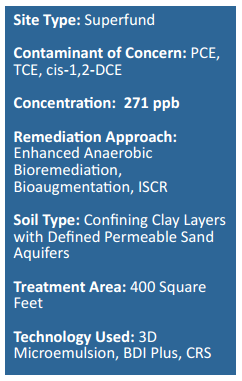 This microbial consortium has since been enriched to increase its ability to rapidly dechlorinate contaminants during in situ bioremediation processes. CRS (Chemical Reducing Solution) is an iron-based amendment for in situ chemical reduction (ISCR) of halogenated hydrocarbon contaminants such as chlorinated ethenes and ethanes.